Born in 1993, Marc Gruber discovered the horn at the age of 4, and now twenty years later, he stands as a model of virtuosic, timeless performance. 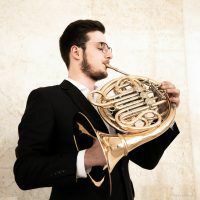 The hornist won Second Prize at the International ARD Competition and was awarded the Brüder-Busch-Sonderpreis as well as the Audience Prize. As soloist, he has appeared with the Bavarian Radio Symphony Orchestra, the Prague Radio Orchestra, the Düsseldorfer Symphony and the Württembergischen Philharmonie Reutlingen.